Significant progress has been made in increasing the rate of breast cancer screening in New Zealand. However, Māori women still have a higher rate of developing and dying from breast cancer than non-Māori. There are several methods that practices can undertake to increase breast screening rates. Significant improvements are being made in the rate of screening for breast cancer, both in the high needs population and in the total population of New Zealand. However, breast cancer remains the most commonly diagnosed cancer1 and one of the leading causes of cancer death in New Zealand women.2 Māori females have a higher rate of breast cancer than non-Māori females and a mortality rate from breast cancer approximately 50% higher than non-Māori.2 Overall the mortality rate from breast cancer is slowly decreasing in New Zealand, but continued efforts to improve the breast screening rate, especially among Māori and Pacific women, are still required. How can a practice increase the uptake of breast screening? There is currently no national system in place that identifies and enrols eligible women for breast screening. Participation in breast screening relies on motivated, well-informed patients and a commitment from general practices to encourage and assist in enrolling all eligible women. The PHO Performance Programme goal commencing from 1 January 2011, is for at least 70% of enrolled female patients, aged between 50 and 69 years, who are classified as high needs, to have received a screening mammogram from a BreastScreen Aotearoa provider within the last two years. Patients defined as high needs include Māori and Pacific women and those living in decile 9 or 10 areas. Data will also be collected for all women aged between 45 and 69 years who are eligible for a mammogram, as an information only indicator. These extended age bands now reflect the BreastScreen Aotearoa guidelines for screening women aged 45–69 years. Calculation of breast screening rates is made using data extracted from the PHO enrolment data base and the National Screening Unit breast screening data base. It is important that all demographic information such as accurate ethnicity and gender are collected and entered. Ensure all practice staff are aware of transport options in your area. Your PHO may have a financial assistance programme which could be used to help cover the cost of transport, if this is a barrier. Click on your region on the map, then select “mobile screening unit schedule” to bring up a list of dates and locations of mobile screening. Consider printing this out and ensuring all practice staff are aware when the mobile screening unit is in your community. Consider coordinating with other practices to increase uptake of the mobile breast screening unit services in your community. Once a patient has been enrolled with BreastScreen Aotearoa, place a recall in their clinical record to ensure that they continue to attend for regular mammograms and update the recall each time a result is received. Follow up patients who are overdue to ensure they are enrolled with BreastScreen Aotearoa and encourage them to make an appointment for their mammogram. A standard screening mammogram involves x-ray imaging of two different views of each breast. When there are signs or symptoms of breast cancer (see sidebar), or a screening mammogram has shown a potential abnormality, diagnostic breast imaging is performed which usually includes additional views of the breast and ultrasound as required. Breast biopsy may also be indicated. Mammograms involve a small exposure to radiation and are described as uncomfortable or even painful by some women. Women who are concerned about the pain involved with the mammogram can be advised to take paracetamol or other analgesia prior to the procedure, however, there is limited evidence that it is effective for this indication. What other imaging options are available? Mammography is the only screening tool for breast cancer that is known to reduce deaths due to breast cancer through early detection.4 Even so, mammograms do not detect all breast cancers. Some breast lesions are not easily visible or are difficult to interpret on mammograms. Cancers can be difficult to detect using mammography in breasts that are dense, with more glandular tissue and less fat. These are some of the reasons that patients and clinicians may consider seeking possible alternatives to mammography such as the use of ultrasound. Breast ultrasound is primarily used in New Zealand to help diagnose or give further information on breast abnormalities that have already been detected by screening mammography and clinical breast examination. Breast ultrasound may sometimes detect small breast cancers that are not easily visible with mammography. Conversely, some cancers are not visible on ultrasound such as micro-calcifications which may be the first indications of breast cancer. Breast ultrasound is not used routinely with (or without) mammography for screening purposes and has not been validated in the medical literature as a screening tool. N.B. Private breast screening is not included in national data collections. Thermographic imaging records the heat distribution on the surface of the breast. In theory, a tumour would appear as a temperature abnormality on the breast due to increased metabolism and blood flow in that area. Thermograms are frequently associated with both false positive and false negative results and therefore are not considered a clinically reliable method for breast cancer detection or diagnosis. Is self-examination of the breast worthwhile? Women can be advised that breast self-examination is unnecessary if they are receiving regular mammograms. It is possible that self-examination may provide some benefit in women outside of the recommended screening age-range, i.e. under 45 or over 70, or those who decline mammography. What is the evidence for breast screening in women aged in their 40s? 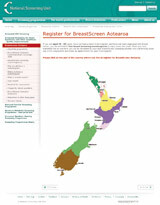 The recommended age range for breast screening in New Zealand was extended in 2005 to include women aged between 45 and 49 years and 65 to 69 years (from the previous recommended age range of 50 to 64 years). Given the potential for benefit, although not statistically conclusive, it seems reasonable to begin screening women at age 45 years, however screening women below this age would require much more evidence on the benefits and harms. For correspondence on this topic, see "Correspondence: The evidence for breast screening", BPJ 36 (June, 2011). Is there a risk of radiation-induced breast cancer from mammograms? There is concern among some women that radiation exposure during a mammogram may result in radiation-induced breast cancer. However, this has never been conclusively proven. Women can be reassured that the risk associated with radiation exposure during a mammogram is much less than the benefit derived from screening. Which women are at higher risk of breast cancer and how often should they be screened? In New Zealand, The National Screening Unit (NSU) recommends that women of any age who are at high risk of getting breast cancer, get their breasts checked regularly, e.g. with a yearly mammogram. N.B. Women aged under 45 years and women undergoing diagnostic rather than screening mammography, will need to be referred directly by their GP to a DHB breast screening service or private radiologist. It is thought that in approximately 5% of cases of breast cancer, an abnormal gene is present – predominantly BRCA1 or BRCA2. Women who have an abnormality in either BRCA1 or BRCA2 have a much higher than average risk of developing breast cancer and/or ovarian cancer, but not all women with this gene mutation will develop cancer. If a woman has a strong history of breast or ovarian cancer in her family, especially if family members developed the cancer before the age of 50 years, it is reasonable to consider referral for genetic counselling to determine her risk. Routine testing for BRCA mutations is not recommended. Women who test positive for a breast cancer gene mutation can reduce their risk of developing breast cancer, with options including more frequent screening (and starting at a younger age), hormonal therapy (tamoxifen) or prophylactic mastectomy or salpingo-oophorectomy (removal of an ovary together with the fallopian tube since the majority of BRCA-related ovarian cancers start in the fallopian tubes)*. Referrals for genetic risk assessment and genetic counselling are funded in all DHBs. BRCA mutation testing is also offered (and funded) where, following risk assessment, the probability of a mutation being present is calculated to be 20% or higher. Risk assessment requires a three generation family history and tumour histology analysis of affected family members. If a familial mutation has not been previously identified, testing begins with affected family member DNA (in order to reduce false negatives) and can take up to six months*. Private laboratories do offer BRCA testing for people who do not meet funding criteria, however, the cost is $2000-$3000*. * NB. These last three paragraphs are an expanded version of what appeared in the printed version. For correspondence regarding funding of this treatment, see "Correspondence: Breast cancer gene testing funded", BPJ 35 (April, 2011). Thank you to Dr Mary Obele, GP Representative, BreastScreen Aotearoa Advisory Group, for expert guidance in developing this article. Ministry of Health. Cancer: selected sites 2007, 2008 and 2009. Health statistics. Wellington: Ministry of Health, 2010. Available from: www.moh.govt.nz (Accessed Jan, 2011). Ministry of Health. Cancer: New registrations and deaths 2007. Wellington: Ministry of Health, 2010. Available from: www.moh.govt.nz (Accessed Jan, 2011). DHBNZ. National summary of PHO Performance 1 January 2010 - 30 June 2010. Wellington: DHBNZ, 2010. Available from: www.dhbnz.org.nz (Accessed Jan, 2011). Nelson H, Tyne K, Naik A, et al. Screening for breast cancer: systematic evidence review update for the U.S. Preventive Services Task Force. US Preventative Services Task Force Evidence Syntheses. Rockville (MD), USA: Agency for Healthcare Research and Quality, 2009. Available from: www.ncbi.nlm.nih.gov/books/NBK36391/#ch3.s1 (Accessed Feb, 2011). Nyström L, Rutqvist L, Wall S, et al. Breast cancer screening with mammography: overview of Swedish randomised trials. Lancet 1993;341:973–8. Berg W, Blume J, Cormack J, et al. Combined screening with ultrasound and mammography vs mammography alone in women at elevated risk of breast cancer. JAMA 2008;299(18):2151-63. National Screening Unit, Cancer Society of New Zealand, New Zealand Breast Cancer Foundation, Royal Australian and New Zealand College of Radiologists. Position Statement: the use of thermography as a breast cancer screening or diagnostic tool, 2010. Available from: www.cancernz.org.nz/assets/files/info/CSNZ_PS_Thermography23August2010.pdf (Accessed Feb, 2011). U.S. Preventative Services Task Force. Screening for breast cancer, 2009. Available from: www.uspreventiveservicestaskforce.org/uspstf/uspsbrca.htm (Accessed Feb, 2011). Humphrey L, Helfand M, Chan B, Woolf S. Breast cancer screening: a summary of the evidence for the U.S. Preventive Services Task Force. Ann Intern Med 2002;137:347-60. Qaseem A, Snow V, Sherif K, et al. Screening mammography for women aged 40 to 49 years of age: A clinical practice guideline from the American College of Physicians. Ann Intern Med 2007;146:511-15. Moss S, Cuckle H, Evans A, et al. Effect of mammographic screening from age 40 years on breast cancer mortality at 10 years follow up: a randomised controlled trial. Lancet 2006;368(9552):2053-60. Baker S, Wall M, Bloomfield A. Breast cancer screening for women aged 40 to 49 years - what does the evidence mean for New Zealand? N Z Med J 2005;118(1221). Johns L, Moss S, Age Trial Management Group. False-positive results in the randomised controlled trial of mammographic screening from age 40 ("age" trial). Cancer Epidemiol Biomarkers Prev 2010;19(11):2758-64. Yaffe M, Mainprize J. Risk of Radiation-induced Breast Cancer from Mammographic Screening. Radiology 2010;[Epub ahead of print]. International Agency for Research on Cancer (IARC). Breast cancer screening. 1st ed ed. Lyon, France: IARC Press, 2002. FH01 Collaborative Teams. Mammographic surveillance in women younger than 50 years who have a family history of breast cancer: tumour characteristics and projected effect on mortality in the prospective, single-arm, FH01 study. Lancet Oncol 2010;11(12):1127-34.